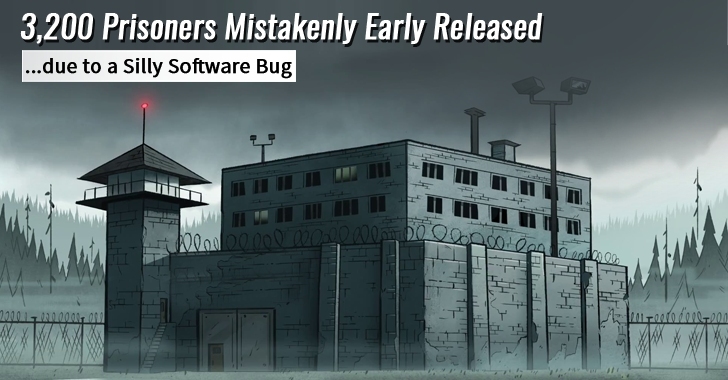 Washington State Department of Corrections (DoC) is facing an investigation after it early released around 3,200 prisoners over the course of 13 years, since 2002, when a bug was introduced in the software used to calculate time credits for inmates' good behavior. The software glitch led to a miscalculation of sentence reductions that US prisoners were receiving for their good behaviour. Over the next 13 years, the median number of days of those released early from prison was 49 days before their correct release date. "This problem was allowed to continue for 13 years is deeply disappointing to me, totally unacceptable and, frankly, maddening," Washington State Governor Jay Inslee said in a statement. "I've [many] questions about how and why this happened, and I understand that members of the public will have those same queries." What's the Bug and How did it Remain Undetected for 13 Years? The issue lies in DoC software that is used for calculating the release date for prisoners who showed good behavior while imprisoned. These credits are then used to shorten the length of prisoner’s sentence. To apply these changes, DoCs around the United States released the new versions of software but unfortunately, the code that calculated prison sentences was faulty. What's even more disappointing is that the authorities first learned of the bug in December 2012, when the family of an assault victim alerted DoC that the attacker was going to be set free too soon. At that time, DoC filed a request, labelling the error as "time sensitive" and to be implemented as quickly as possible. However, the Washington DoC hired a new IT manager in November, who alerted the authorities of how serious the bug had become. Inslee assures that a full fix for the bug is expected to be rolled out by 7th January. Until then the DoC has been ordered not to release any prisoner without manually checking their actual release date.